Kale is everywhere these days. I find it funny that over 20 years ago, when I was waiting tables at a family restaurant while in college, we used it as a garnish for plates. No one would even dream of eating it. Now, it’s one of the famous “super foods” that’s all the craze. And I will proudly say that I’m a fan. This salad was delicious. It was the dish that represented the movie “War Horse” for my 24×24 party. In the film, the horse owner was a farmer, so I wanted to choose a farm to table dish to represent it. Put kale in a bowl. Place walnuts in a dry skillet and toast until fragrant and warm. Remove and chop. Zest both lemons and add to kale. Toss in walnuts, then juice lemons over the mixture. Add oil (a generous amount, or else however much you like), salt and pepper, then toss. Add cheese in (again, as much as you like) and toss salad several times to ensure everything is coated. Taste and adjust seasonings to your liking. 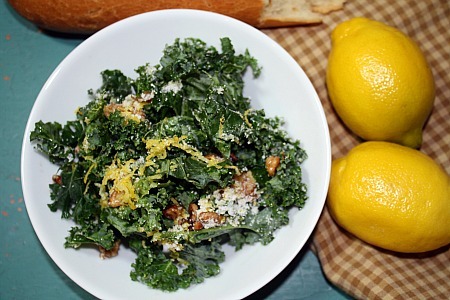 This entry was posted in 24x24, cheese, kale, lemon, nuts, QuickAndEasy, salad, side dishes. Bookmark the permalink. I didn’t think I would love raw kale salads as much as I do! You dressed it perfectly. The “crunch, crunch” made me laugh. I like kale, too, and I have to admit that when it first started getting big I wasn’t sure if it was really edible! I thought it was garnish, too. This salad looks like the perfect way to enjoy it. What a wonderful healthy salad – perfect – I’m making this! !